It is replaced by the TSC TA210. A 203 dpi printer that is affordable, durable, and easy to use. The TSC TA200 offers a low initial price, uses the most cost effective supplies available, and is built to last. The TA200 can print a wide variety of labels ranging from shipping labels to compliance and general purpose product identification labels and tags. 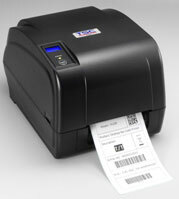 TA200, Thermal transfer label printer, 300 dpi, 3 ips, 8MB SDRAM, 4MB Flash, USB. TA200, Thermal transfer label printer, 300 dpi, 3 ips, 8MB SDRAM, 4MB Flash, Ethernet, USB, Parallel and Serial.